A close-up of a stele found at Poggio Colla, a site of religious ritual for the ancient Etruscans. 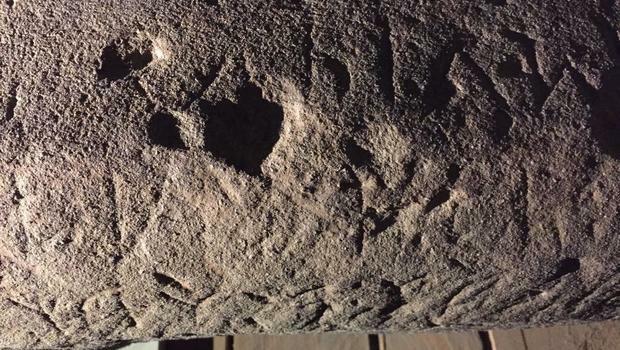 An ancient tablet recently unearthed in Tuscany has revealed its first secret: the engraved name of a goddess linked to fertility. The 500-pound (227 kilograms) stone slab, or stele, was unearthed earlier this year at Poggio Colla, a sixth century B.C. site built by the Etruscans. The stele bears a long inscription in a language that has not been used for 2,500 years, project archaeologist Gregory Warden, a professor emeritus at Southern Methodist University in Dallas, told Live Science in April. The 500-pound stele, partly cleaned, bears the name of the Etruscan fertility goddess Uni and the head of the Etruscan pantheon, Tina. Uni was an important goddess linked to fertility. Previously, the most famous find at Poggio Colla was a piece of ceramic depicting a woman squatting to give birth, perhaps suggesting that a fertility cult worshiped at the site, according to Warden. The Etruscans were a heavily religious society that started around 700 B.C. in modern-day northern and eastern Italy. They flourished until they were absorbed by Rome, a gradual process that took place between 500 B.C. and 100 B.C. There are at least 120 characters on the Poggio Colla stele, making it the longest Etruscan inscription ever found on stone and among the longest three sacred texts ever discovered, researchers will report in a yet-unpublished article in the journal Etruscan Studies. The inscription might express the laws of the sanctuary, Warden said, perhaps outlining the ceremonies that took place there. Archaeologists have deciphered another word on the tablet, “Tina,” which refers to the head god of the Etruscan Pantheon (much like Zeus for the Greeks). Archaeologists have been digging at Poggio Colla for 21 years, and found the slab at the very end of the most recent field season at the site. It’s about 4 feet tall and 2 feet wide and made of sandstone. Because the stone is scuffed and chipped, researchers are painstakingly cleaning it in order to translate the words. Etruscans left behind few texts because they mostly wrote on linen or erasable wax tablets. Understanding Etruscan religious belief and ritual is important because as the civilization was engulfed by Rome, it influenced Roman culture and belief. Most previously discovered texts are short inscriptions on graves, according to Warden. One linen book written in the Etruscan language was found on an Egyptian mummy — recycled as wrappings. Otherwise, researchers know little about Etruscan religious rituals, other than that they were polytheistic. Though the stele is still being cleaned and studied, a hologram projection of it will be displayed in Florence on Aug. 27 as researchers announce the translations they’ve made so far.